The stunning Taj Mahal in Agra, India, is among the most stunning architectural achievements in history. Although its primary function is that of a mausoleum, the structure is actually a complex with a variety of functions. The heart of this palace-like structure is the Taj Mahal Tomb, which contains two exquisite cenotaphs representing the occupants of the tomb, Shah Jahan and his wife Mumtaz Mahal. A cenotaph is tomb which is empty and meant to represent the people who have been interred. 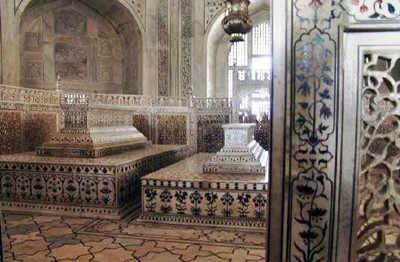 The actual bodies of Shah Jahan and his wife are buried beneath their cenotaphs in a lower chamber. 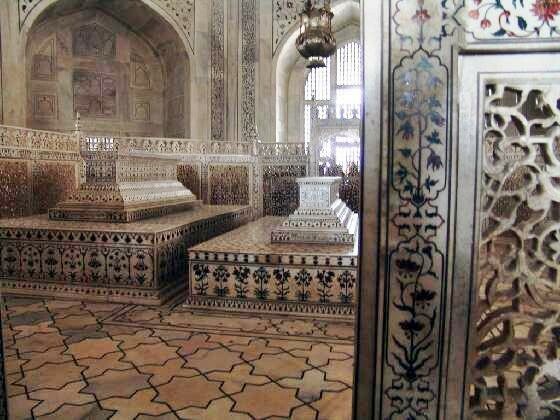 Both cenotaphs are elegantly carved and inlaid with semi-precious stones. Shah Jahan was the emperor of the Mughal Empire. He began building the Taj Mahal in 1632 upon the death of his much beloved wife Mumtaz, who died giving birth to his 14th child. It took nearly 20 years and thousands of workers to complete the Taj Mahal and the magnificent tomb – all of it in memory of Mumtaz Mahal. The Taj Mahal tomb itself is basically a cube-shaped structure measuring about 180 feet per side. It has chamfered corners and it topped by a large dome and “moon-cusp” finial. The whole structure sits atop a square plinth and has an arch-shaped doorway, called an iwan. The onion-shaped marble dome surmounting the structure is a marvel in itself. It’s about 115 feet high, which is the same as the length of its base. This is perched atop a cylindrical column about 23 feet high. At the top of the dome is a lotus design. Smaller domes positioned at the corners of this primary dome design create a pleasing symmetrical effect. At the top of the dome is a finial spire thrusting an upturned crescent moon toward the sky. The moon cusp is a common Muslim motif. When first built, the finial was covered in gold, but is plated with bronze today. You might say that the Taj Mahal Tomb is a work of architectural brilliance within a work of architectural brilliance.